Are you taking full advantage of your WordPress media library? There are multiple options available for admins who upload different graphics and videos on to their pages and posts. Technically, media refers to images, video, recordings, and files, so basically “media” encompasses everything that you upload on to your blog or website. Whenever you upload media, it automatically gets added to your media library. Let’s explore what the media library is and how to use its many different features. Accessing the media library is easy. On the left side menu of the admin page, you will see “media” which, when hovered over, will give you the option to visit the “library”. Simply click “library” and you will immediately see all the media that you have ever uploaded to your site. Once in the library you can manipulate the different media. Actions that can be taken on selected media include viewing, editing, and deleting. On top of this, the user can also search for different media using the search box on the top left. Sorting the different media is easy. Simply click “file”, “author”, “attached to”, or “date” and it will quickly be sorted based on that criteria. Once you have found the media you are looking for, you can click “edit” and the media file will appear in a new window. Here you have the option of changing the title, caption, description, and url of the image. It is important to have a system for titling your images. Without a proper title, you will have a more difficult time finding the proper media while searching through the library. Any media that is in a post or page is considered “attached”. If you have uploaded media but it is not currently on a page or post then it is classified as “unattached”. “Unattached” media can be added to a page or post through the media library. Simply find the unattached image you want, click “attach” and add it to the appropriate page or post. The only action which can be done in bulk is deleting. Simply click the images that you no longer want to have in your media library and select “delete”. All other actions are considered immediate actions and can only be done with one image or piece of media at a time. A new version of WordPress will be launching in the coming weeks and changes to the media library are likely to happen. This guide will provide you with a basic understanding, though, of how to navigate the media gallery. 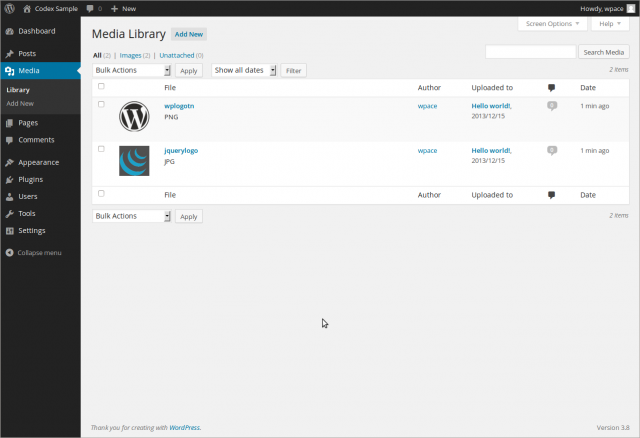 Like most aspects of WordPress, the media library was designed with a beginner user in mind. It’s not complicated and can usually be mastered in a few minutes. If you are dealing with a website that is complex and never seems to do what you want, consider switching to WordPress! We build custom designed WordPress sites that are easy to use and appealing to all of your audiences. To learn more about our services, feel free to get in touch with us!